CT1112-1 is an Aluminum Oxide (Al2O3) coating applied using the plasma spray process. The coating is high purity, very hard, well bonded and suitable for use where the dielectric and or wear resistant properties of (Al2O3) are required. CT1112-1 is effective in applications where the component is exposed to abrasive media over a wide temperature range. 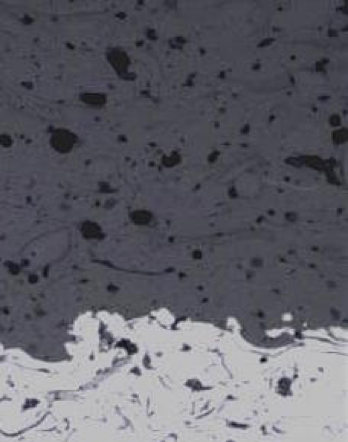 Use up to 2500º F.
CT1112-1 is used for severe service conditions of abrasive wear, hard surface wear, and high temperature erosion. Typical components coated with this coating are electrical circuitry (dielectric), textile equipment (resistance to wear by fibers and threads), Hot Isostatic Press (HIP) cans (chemical inertness and resistance to elevated temperatures), and induction coils (resistance to elevated temperatures, wear resistance, dielectric). Finish CT1112-1 by diamond grinding. Finishes of 20-50 Ra are possible by grinding.